Fortress Of Freedom Board :: View topic - Urban Renewal Via Spray Paint! Urban Renewal Via Spray Paint! Posted: Sun Sep 20, 2009 11:01 am Post subject: Urban Renewal Via Spray Paint! 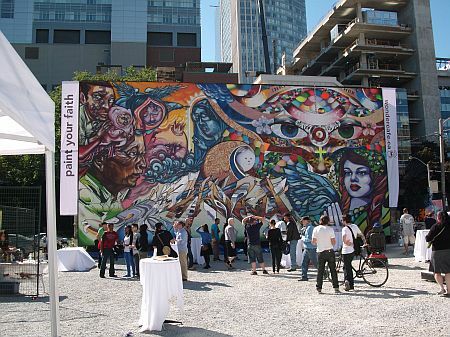 The "Paint Your Faith" Mural in downtown Toronto. September 19, 2009 - Toronto, Canada. A huge three story mural now graces Toronto's city scape in the city's downtown core. The mural was commissioned by a local church (Metropolitan United Church) to paint one of it's walls, and four renowned aerosol painters were contracted to paint the mural. Their mission through art was to collaboratively interpreting what faith means to them. 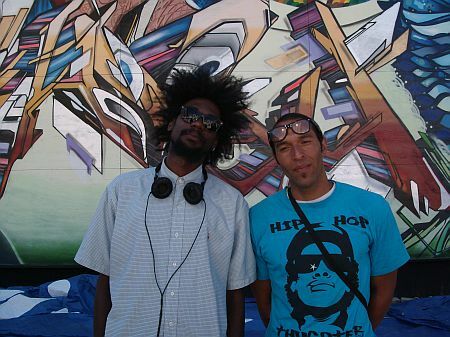 Two of the artists (Elicser on the left and Chor Boogie on the right) in front of their mural. We were able to visit the mural and meet two of the artists at an outdoor reception for the unavailing of the mural. Chor Boogie is a international muralist, painter, as well as a curator and instructor from San Francisco. Elicser is probably one of Toronto's most recognized and accomplished aerosol artists. Elicser was also a participant of a recent Housepaint Exhibition at the ROM (Royal Ontario Museum) here in Toronto. Not present when we visited the mural are the two other artists. Siloette is an illustrator/designer/muralist from San Francisco. She approaches every creation with consideration. Her work can be found on walls, clothing and advertising around the world. Mediah is a Toronto-based aerosol and new media artist. He has been active since 1994 and has had his artwork exhibited across Canada and showcased in Rome, Mexico, San Diego, Naples, Milan, New York, Texas and Germany. Mediah is an artist from Toronto who used digital media to create experimental graffiti lettering to create what he calls "neo-dynamism." Other artists getting involved in the "street scape!" In addition to the four famous artists were many other artists painting their "urban composition" at the unavailing along with a DJ and food and refreshments for the audience. 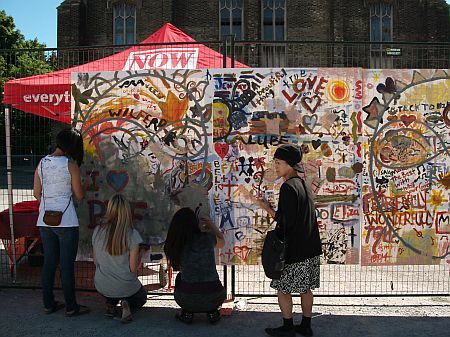 The urban landscape of downtown Toronto just got a jolt of creativity!